1996 marked the inauguration of BNF (National Library of France), the starting point of a major urban redevelopment of a former industrial area, located on the Left Bank of the Seine, between the river and the railway lines from Austerlitz train station. Since then, the ZAC Paris Rive Gauche (the name of this urban project) has been evolving with different phases, and the area regularly sees new buildings being constructed, together with the transformation of former industrial buildings, like the Frigos (refrigerated warehouse), now a residence for artists, the former Industrial Mills (now part of a university) or the SUDAC (former compressed air plant transformed into an architecture school). In 2006, the elegant and modern footbridge Simone de Beauvoir was opened, connecting the new district to Bercy, its counterpart on the Right Bank. In 2017, the Station F, promoted as the biggest start-up incubator in the world, opened in an impressive 1920s concrete structure of over 300 metres in length and is now a new way to connect the elevated district near the BNF and the old one West of rue du Chevaleret. I like wandering in this area because there’s always a new building to see, a new skyline, in this human-sized new district. 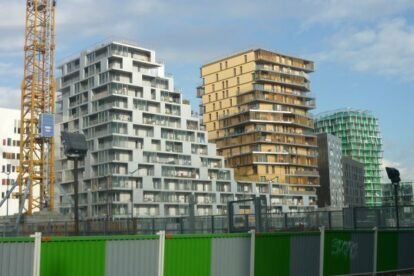 I particularly like the curves, colours, tortuous shapes and mixtures of materials used in most of the modern buildings (houses or offices), which break with the too homogeneous ”haussmannian” style of central Paris.